Desert Island Singles: “All For You” by Sister Hazel (1997) | Name-Brand Ketchup. ← I can go to the store and buy several of these. “Timeless” is such an overused term. Hardly any piece of creative work, let alone a three-minute pop song, can ever truly transcend the era of its creation. 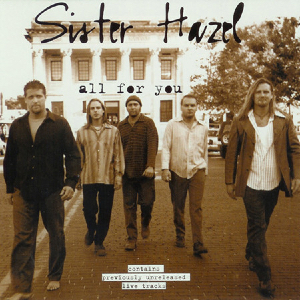 However, this one comes close: Sister Hazel’s 1997 hit “All For You,” today’s Desert Island Single. Sister Hazel formed in Gainesville, Florida in 1993 and was named for Sister Hazel Williams, a local nun who ran a homeless shelter. They recorded their eponymous DIY debut CD in 1994, and their second, “…Somewhere More Familiar,” in 1997. “All For You” appeared as an acoustic number on their first CD, and they re-recorded the more familiar single version for the second. That’s the album that got them signed to UMG, where they stayed for five years before going back to the indie route which is where they are happily now. So far they haven’t had a hit bigger than “All For You” (#11 on Billboard in 1997), but it’s still a song that just about any other band would give anything to have recorded. To my ear they’re reminiscent of The Ozark Mountain Daredevils at that band’s best. “All for You,” simply, has one of the great sing-along choruses of the ’90s. Timeless, I said, and I stand by that. This song would have been a hit in the ’70s and today. PS: That is NOT Sister Hazel pictured in the Youtube clip. It’s Blues Traveler. Go figure.